Holiday well-wishes aren’t just for family and close friends. They are also a great way to connect with job networking contacts. Sending holiday wishes not only makes you stand out from the crowd, but it also shows people that you appreciate their time and effort in your job search. One of the most efficient ways to pass along holiday cheer is by using LinkedIn to send holiday wishes to job contacts. Here’s how to make this networking technique work for you. The first thing that job seekers should do is to look at their list of LinkedIn contacts and ensure that no one has been left off. If you’ve made new contacts recently or notice that old friends are not on the list, send them a quick connect request to flush out your list. While you’re at it, remove anyone who doesn’t need to be on the list any more. There shouldn’t be many of these but there may be one or two that need to come off. Then, decide who you want to send out a holiday greeting to. For networking purposes, you should include not only old coworkers and employers, but also people you have interviewed with, people who act as your references and networking contacts who you have met at events. Don’t forget to include recruiters to let them know that you’re still job hunting. 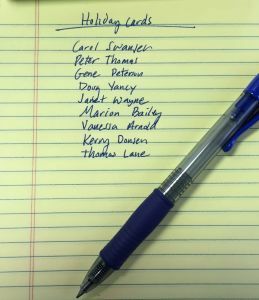 Further separate your contacts into a list of ones who will receive a personal note and another list of those who will receive a generic holiday message. In today’s diverse culture, it’s best to keep the content of your message fairly generic. Avoid saying Merry Christmas and opt for Happy Holidays instead. This avoids offending Jewish contacts or others who don’t celebrate traditional Christmas. To really stand out from the crowd, skip Christmas and consider sending Happy New Years cards at the first of the year. With regards to the content, avoid talking about your ongoing job hunt or asking for a job. This is a chance to embrace the holiday spirit and not beg for a job. The very fact that you send a holiday greeting will be enough to stay in the front of your contacts‘ minds. For contacts who don’t know you well, include a brief note reminding them how you met. Sending holiday greetings from LinkedIn can be accomplished in two ways. You can send greetings as a single post by entering the text of your message into the update field of LinkedIn. Then, select Connections underneath the text field and then click Share. You can also send individual messages to the connections who you have a more personal relationship with. Sending your greetings through LinkedIn is not only easy, it also allows you to collect the replies in one place. That means that you won’t have a stack of physical cards or a mass of emails to sort through when contacts reply with job opportunities or updated contact information. Whether you live in Michigan or around the country, the employment experts at Vertical Media Solutions can optimize your LinkedIn profile. Our personalized writing services are designed to encourage professional networking and improve profile visibility. Learn how we can help today: 616-631-4300.